As anyone who's ever used Unity knows, one of the most complicated things to get right is a third-person control and camera rig. There's a long list of things that need to be handled and interacted with and avoided, and the Internet is full of examples that range from incomplete to semi-functional to just plain awful. While doing research for a potential third-person platformer project, I decided that maybe the best thing I could do would be to churn through all the knowledge and tutorials and examples I could find for creating a third person controller and camera rig, implement as much of it as possible, and then whatever I manage to get done this month, I release all the code. You're not wrong. By any reasonable definition I don't think I can describe this as a game, or at least not one that's particularly entertaining since it's a sandbox with no activities except running, jumping, sliding, and playing with a camera. However, after nine months of turning in projects which are all unquestionably games, I figured I could bend the definition a bit in order to release this demo and code as a 1GAM project. What I've got here is, I believe, a fairly solid foundation for a general-purpose third-person control system and associated camera control system. Giving credit where it's due, I tested/examined/analyzed/read about plenty of character controller options, and by far the best starting point for someone wanting to roll their own was the 3DBuzz 3rd Person Character System tutorial video series. If you've already worked on something like this, there will be some parts of this series you may want to skim through or skip altogether, but overall this is a great introduction to this kind of project, and I used their code as the initial structure for my controller. There are places where the code is still essentially what is demonstrated in that series, and there are places where I modified, enhanced, or ripped out parts of their system (more specifics on that later). But if you want to understand the theory, that video series is the place to start. 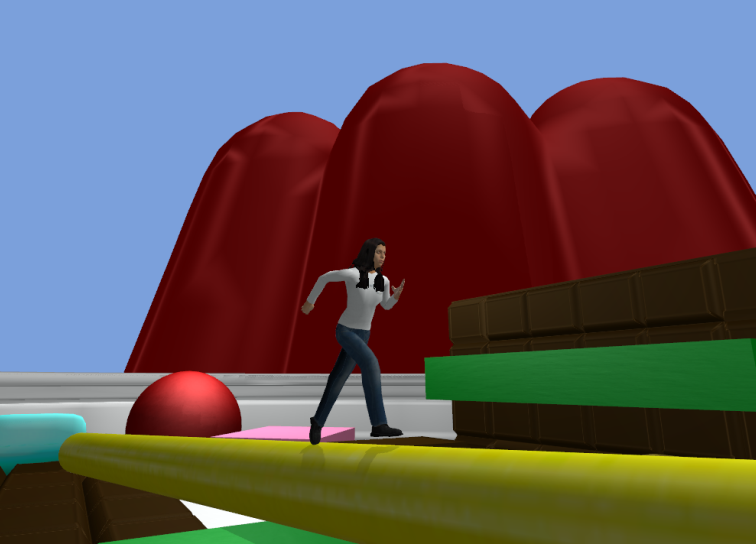 A character controller needs to handle player input, character locomotion, collisions, jumping, gravity, grounding, relevant environmental factors (what is the ground like where you're standing? ), and that's just to get basic functionality. On top of that, you need a camera that works for that style of gameplay, which becomes dramatically more complex when you start trying to make your camera intelligently prevent occlusion (in simple terms, getting itself out of situations where an object is between the camera and the thing your player wants to see). 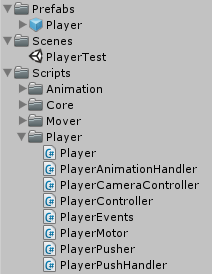 Handled for now by Unity's CharacterController object. This solves some problems and causes others. Unity's CharacterController acts as a physics object in some ways and not in others, which makes it easier to work with but doesn't provide some features needed for a more robust controller. I have previously written a 2D character controller that used a rigidbody and raycasts/sweeptests to deal with collisions, so the long-term plan is to drop the Unity CharacterController in favor of a similar script modified to work in 3D, but this works for now. Base fall speed setting to "jump start" falling - makes walking off of ledges less "floaty"
Still needs work - some intersection events still possible in some situations, and it should be possible to apply arbitrary temporary pushes to a character for attack responses, explosive forces, etc. Animations are stock - I needed to limit myself to free animations I could include with the example project, and my usual source was giving me some problems, so I had to make do with some demo animations included in Unity Mecanim tutorial projects. As a result, the animations are definitely not great for this purpose, particularly the sidesteps, but I would assume anyone using any of this code would be providing their own model and animations anyway. All code available here is either entirely of my own making, or based on the referenced 3DBuzz video series which is freely available, so to my knowledge you should be free to use the included code in whatever way you see fit. I know for my part I reserve no rights to this code, so use it as you will. Implementation of a single master behavior, meant to serve as a central interaction point for external classes, so other objects don't need to know if they need to talk to the motor, or the controller, or the camera, etc. 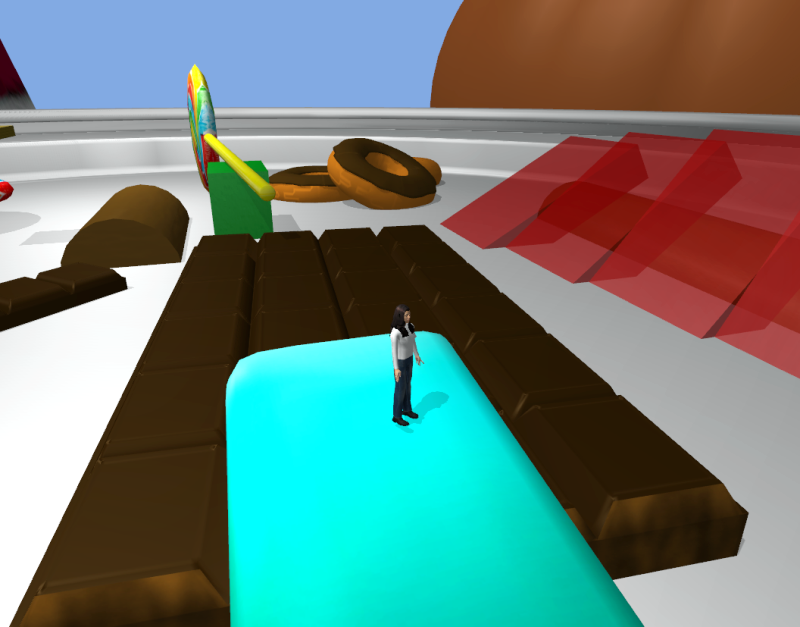 Addition of Push/Pusher system to allow interation of player and moving rigidbodies. By my best estimate, a third person character controller and camera rig like this needs to handle about 400 different things, and I'd say I've got around 100 of them taken care of now. So there's a long way to go, but it's already much, much more capable than many of the samples I found while searching for examples and advice, so I think I'm on the right track, and I might actually end up with a fairly robust controller when I have another block of time to work on it. But for now here it is, and hopefully it's helpful in some way.